This morning at the Professional Association for SQL Server (PASS) Summit, we celebrated SQL Server 2014’s strong momentum and introduced new services that further expand Microsoft’s big data platform. We announced a major update coming to our database-as-a-service, Azure SQL Database, and easier access to our machine learning service, Azure Machine Learning. These new updates continue our efforts to bring big data to everyone by delivering a comprehensive platform that ensures every organization, every team and every individual is empowered to do more and achieve more because of the data at their fingertips. I’m really pleased to be making these announcements today at PASS Summit, where, along with my colleagues Joseph Sirosh, corporate vice president of Machine Learning and Information Management; and James Phillips, general manager of Data Experiences; I delivered a keynote highlighting the momentum of SQL Server 2014 and other recent releases in our data platform such as Azure Stream Analytics, Azure Data Factory, Azure DocumentDB, Azure Search and Azure HDInsight. As the world’s largest gathering of SQL Server and business intelligence professionals, PASS is hugely important, enabling us to connect with SQL Server customers and gain valuable feedback to help inform the product’s development. 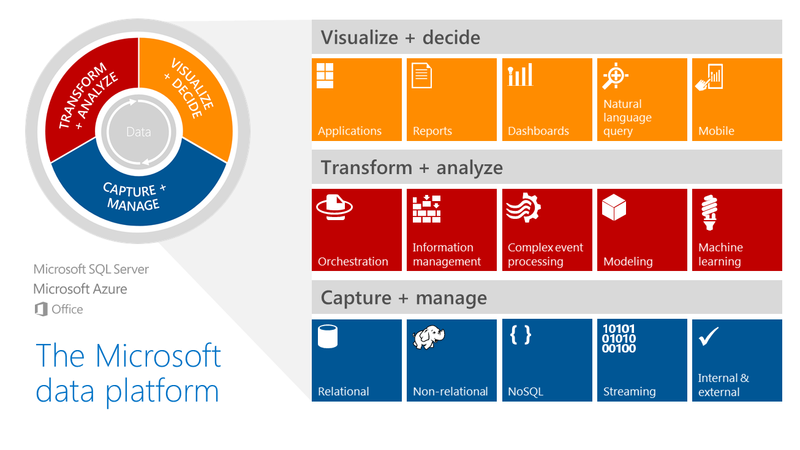 SQL Server is the cornerstone of our big data platform. It is the world’s most widely-deployed database and is used across the globe for mission critical enterprise deployments. Last month, based largely on our work with SQL Server, Microsoft was recognized as a Leader in Gartner’s Magic Quadrant for Operational Database Management Systems, and positioned furthest to the right in completeness of vision*. Earlier this year, we released SQL Server 2014, which includes built-in breakthrough in-memory OLTP and columnstore technologies, as well as hybrid cloud capabilities. Since then, SQL Server 2014 has seen tremendous growth and positive reception among customers, with more than 1.2 million downloads to date and 30 percent of Azure SQL Server virtual machines currently running SQL Server 2014. Clalit, Dell, Eastman Chemical Company, GameStop, Kiwibank, LC Waikiki, Pros, Saab and Stack Overflow are just a few of the customers using SQL Server 2014. GameStop is using SQL Server 2014 in two main scenarios: disaster recovery and backup to Azure to accommodate the company’s infrastructure freeze for holidays and big game launches, and as the default install for new SQL Server instances. Stack Overflow is a question and answer site for professional and enthusiast programmers. By basing their platform on technologies like SQL Server 2014 (specifically taking advantage of AlwaysOn Availability Group replicas), they can have a highly available, high-performing platform that easily and quickly gets answers to thousands of global users. Later this year, we will preview a new version of Azure SQL Database that represents another major milestone for this database-as-a-service. With this preview, we will add SQL Server capabilities that will make it easier to extend and migrate applications to the cloud, including support for larger databases with online indexing and parallel queries, improved T-SQL support with common language runtime and XML index, and monitoring and troubleshooting with extended events. In addition, the preview will unlock our in-memory columnstore, which will deliver greater performance for data marts and continue our journey of bringing in-memory technologies to the cloud. We will offer these new preview capabilities as part of the service tiers introduced earlier this year, which deliver 99.99% availability, larger database sizes, restore and geo-replication capabilities, and predictable performance. Microsoft Azure Machine Learning is a fully managed cloud service for building predictive analytics solutions, and helps overcome the challenges most businesses face in deploying and using machine learning. Starting today, it will be easier than ever for anyone to try Azure Machine Learning, as the service is now available to test free of charge without a subscription or credit card – all customers need to get started is a Microsoft account ID. This free tier is one more way Azure Machine Learning is making advanced analytics more accessible to more people. DBAs, developers, business intelligence professionals and nascent data scientists can now experiment with Azure Machine Learning at no cost. We are making all these investments in SQL Server and the rest of our data platform because we are living and working in an amazing time where organizations are utilizing data to make smarter decisions, better predict their customers’ needs and provide more differentiated products and services. Data has become the new currency and it is helping to differentiate today’s leading companies. To get there, organizations need a comprehensive platform to capture and manage all of their data, transform and analyze that data for new insights, and provide tools which enable users across their organization to visualize data and make better business decisions. Microsoft’s approach is to make it easier for our customers to work with data of any type and size – using the tools, languages and frameworks they want – in a trusted environment on-premises and in the cloud. To learn more about our approach to big data, visit our web page.